Trekking on a budget as part of a round the world trip isn’t easy. Making sure you have the right gear isn’t simple either, so after much research (and subsequent testing) here’s our Nepal trek gear list. When we arrived in Nepal to head on the Everest Base Camp trek via the Cho La Pass we had been traveling for 10 months. Our travel was mostly in warmer climes. We carried only a 40 litre Osprey Farpoint backpack each (they’re great, we love them, buy one today.). We are still carrying them to this day (March 2018). We put together our Trek Gear List for Everest Base Camp and I still stand by it. As we arrived in Kathmandu overland from India to Nepal we didn’t have gear for trekking, so we had to shop. 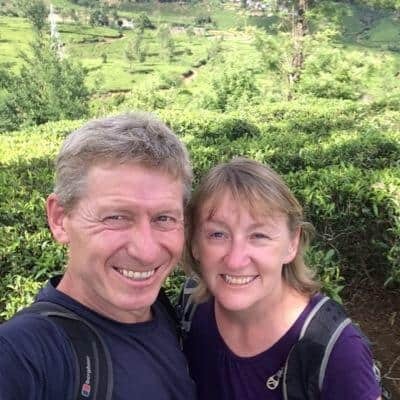 Our plan was to shop for trekking gear in Kathmandu, buy the minimumm needed and not break the bank and then donate our unwanted items to a Nepali Porter charity, as we would be carrying on backpacking into India and wouldn’t need the gear. Was our Trek Gear List Enough? How Much Did we Spend on Trekking Gear in Kathmandu? We would be trekking on the Everest Circuit and over the Cho La pass. We trekked with Australian Company World Expeditions, who sent a trek gear list to us. they also provided certain items. 80 litres! All that room was like Christmas after managing for 10 months with 40 litres! We left our 40 litre Osprey Farpoint 40’s in Kathmandu with our laptops, swimsuits and other items that we wouldn’t need. We locked them with padlocks and left them at the hotel we were staying at. IMHO the Osprey Farpoint isn’t suitable for the Everest Base Camp Trek, as it opens almost fully. Most of the time when I was trekking I didn’t take off the day pack I had someone else reach into it and grab what I needed. That’s not possible with the Farpoint because of how it opens. The mesh pockets on the side are also not big enough to fit water bottles into. (Note that what we bought in Kathmandu was mostly from Shona’s Alpine – details on Shopping for Trekking Gear in Kathmandu here🙂 Note that Shona’s also rent trekking equipment like backpacks, sleeping bags, down jackets if you don’t want to buy. Tell them ASocialNomad sent you! Before we get into the detail of our Trek Gear List, here’s the single most important thing that you can take on your trek in Nepal and that’s insurance. The fittest member of our group was airlifted out of Machhermo with Acute Mountain Sickness. That’s altitude sickness. He couldn’t walk more than a few steps, his lips were blue and he spent the night in an oxygen tent before he was medevaced out. The doctors in Kathmandu indicated that if he’d tried to walk out he would have died. His helicopter evacuation cost US$5,000. He had to provide his credit card before the helicopter could be called. His insurance company paid in full. We have claimed twice on insurance in the last year, taking emergency flights back from both Central America and Central Asia for (unrelated) family emergencies. In both cases our travel insurance company have paid in full. In total we would have been out nearly US$10,000 if we hadn’t had coverage. Trekking at altitude carries risks. We insured ourselves through World Nomads – buying specific altitude coverage in case of altitude sickness that affected Tim on our trek. As our trip was longe than 12 months, we were also able to renew our policy while out of our home country. 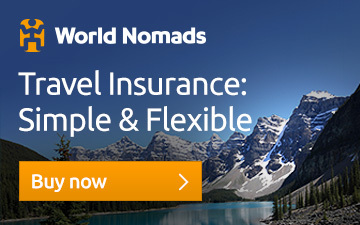 Get a price for your travel and health insurance now. 80-litre kit bag. Provided by World Expeditions. 1 pair of crocs – showers/camp shoes – giving your hiking boots a break is good for them and your feet each day. Plus you may need to dry them overnight if you’ve been hiking through mud, snow or water. 1 pair of waterproof trousers -zip open to the knee (bought in Kathmandu, donated after) – these are really useful, as you can take them on and off without taking your boots off. 1 Buff (bought in Kathmandu, still carrying) (keeps the greasy hair out of your eyes. Adds warmth under a hat. The Go Outdoors stowaway jacket was the only outer jacket that we had. (Apart from the down jacket provided by World Expeditions). We contemplated buying a windproof jacket, but this stowaway jacket was also windproof, and when I got cold I just added layers. My record was five layers plus the jacket. I was cosy. 1 large quick drying towel between us (already travelling with) – I would just take a small one, we even contemplate cutting this up to reduce weight. Our guide to buying the best travel towels is now available – our favourite dries us well and fits in the palm of our hands. Find out more about how to buy the best travel towels. Shee Pee – saves going out of the tent in the night! Our trek leader Ramesh was carrying a full first aid kit. The team also carried a portable oxygen chamber too. So we were light on first aid equipment. It’s advised to take antibiotics with you, I didn’t have any, but Ramesh gave me some of the team antibiotics when I had stomach problems. Suncream Factor 50 – you’ll need it! A decent watch – hiking trails in Nepal are measured in hours and minutes not distance. Its always good to know how long you’ve been on the trail. 750ml water bottle (already travelling with) – if I didn’t have this, I’d have bought 2 wide-mouthed Nalgene bottles. We carry a filter water bottle – you can find out how we selected which one we bought in this buying guide for water filter bottles. We also carry a steripen and a water filter bottle (we didn’t use the filter bottle in Nepal as we were getting boiled and treated water from World Expeditions). 1 trekking pole (bought in Kathmandu, donated after). Now I trek with two poles, as my hands swell at altitude if I don’t use poles. Spare batteries for your camera if you don’t have rechargeable ones. And the kit list was spot on. We didn’t need a separate heavier windproof jacket, our layering (I had five layers plus my raincoat on at one point) was enough. Sleeping in thermal tops, bottom, gloves, socks and hat meant that we weren’t cold at all at night. – even when the temperature dropped to negative 10 degrees. We spent US$260 on boots and kit and I don’t think we could have spent less, our regular travelling clothes are all quick dry and well used, but still completely serviceable. Everything is negotiable in Kathmandu, but we bought most of our gear (apart from the boots) in Shona’s where we felt we got a fair price and decent gear. You can read our day by day progress on our trek to Everest Base Camp, starting with Day 1 – where we go from Lukla to Monjo. Hey! We are booked and doing this trip April 12 – May 4 2019. What month(s) did you hike in? Trying to get a feel for seasonality for clothing. I know you’re busy, but anything helps! Hi there! We started flying to Lukla April 3rd. It was a mix of spring conditions and also one bad snow day (lots of snow, not specifically cold, but very wet!) Once the sun goes down it gets cold, but our trekking compay provided huge down jackets, which were great for sitting in huts on a night! Hello…I am landing in Nepal on February 3… I will be there for 6 month doing voluntary work on the absolute west en of it. However I would like to do the trick to Everest base camp but there may be a hick…my age 69 by that time. I will do al to of walking around the west end of Nepal in order to prepare myself and be more fit. Is there anything that could stop me aside -may be -from altitude sickness. Hallo there Georges! The hiking is actually very easy to Everest Base Camp, you won’t walk very far each day at all, it is just the altitude that is the challenge. When we hiked to base camp we hiked with 3 x 63 year olds – all of whom made it there and back in good spirits and good health. One even hiked to the top of Kalapathar! En route to base camp we met up with 2 70 year old Japanese trekkers, who were carrying ALL their own gear! I’d suggest a visit to your doctor prior to setting off – our older trekkers had done so (they were Australian and American) and had obtained diamox tablets from their own healthcare professionals, this certainly helped their acclimatization, but none of them suffered in any way with the altitude any more than the rest of us did. I hope this helps! The best thing that I found about trekking was the importance of a positive mental attitude, drinking a lot of water and not snoozing in the afternoon. It is a magnificent country and this is a stunning trek, do keep in touch and let us know how you get on!